Domain Advice editor, Dan Butkovich, steps through the pros and cons of open plan design. There is a certain irony in viewing a TV renovation program when you’re moving house, or mid-renovation yourself. Sure, it’s inspiring, but I tell you what – I’ve been very close to the tears of frustration we’ve seen already this season on The Block and the moving journey (reality TV cliche #1: check) is not even close to over. 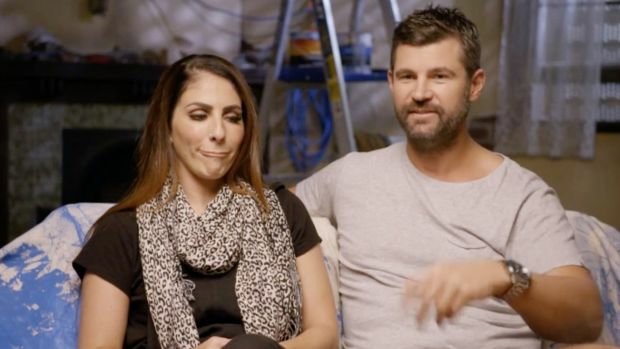 More tears are sure to eventuate this week as we watch our favourite amateur renovators unveil their living and dining rooms. If bathrooms and kitchens sell homes, living rooms are not far behind and they certainly have the capacity to turn potential buyers off like few other rooms. The stakes are even higher because of the sheer scale of these rooms. Most apartments in Australia would easily fit inside just these rooms and as we saw with master suites, too much space can actually kill your chances of victory. Hans, last week on the receiving end of a blast from judge Neale Whitaker, fears the size of his room means he and Courtney won’t finish. Undeterred by criticism from our own Alice Stolz about their Luna Park wallpaper (sorry guys, but she’s always right), Sara returns shopping shocked at the appearance of a door. Yep, a door. “Get rid of it or I’ll throw a hammer through it,” Sara commands Hayden. “And I’m not lying.” Don’t worry, Sara, no one thought you were. 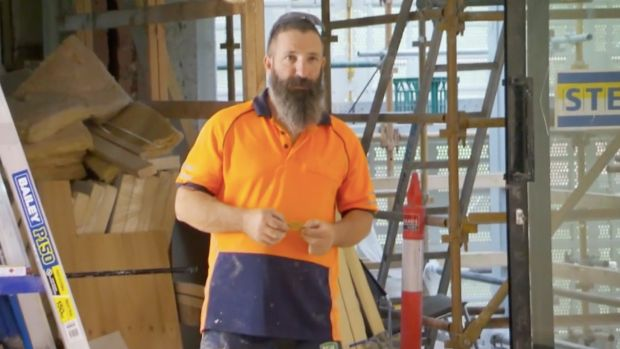 Tempers continue flare between the pair, leaving us all feeling like their builder, Jack. Stuck in the middle. 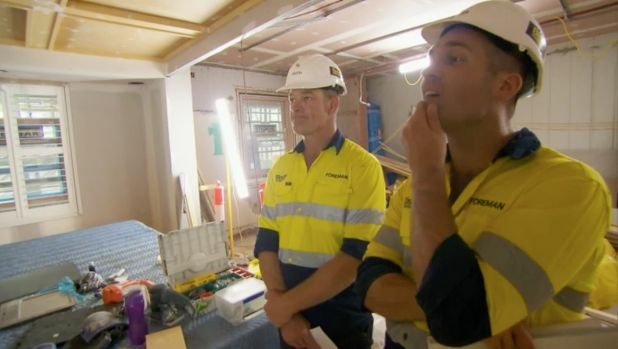 The drama of Kerrie and Spence’s ceiling continues, with the ceiling police (Keith and Dan) ordering that because it was too heavy, at 19kg, without lights, nothing could be added to it; only by the building’s joists. 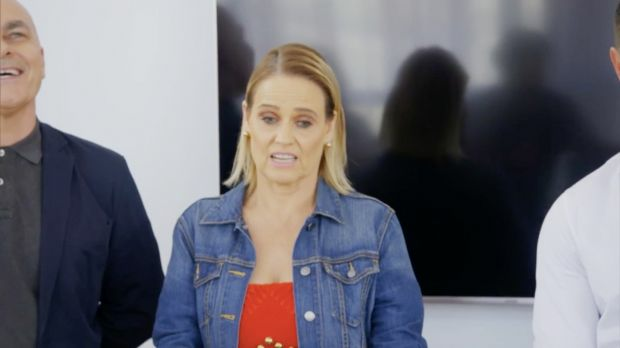 Hayden and Sara have continued airing their dirty laundry through the night, on camera, with even talk of divorce as their argument, which, let’s remember, started with talk of a door, continued through the wee hours. With all of this palaver, it’s a miracle anything got done in time for judging. The imminent arrival of the cushion royals has the couples on edge, and fair enough too. I’ve met all three of them before and though extremely polite, there’s a steely glint in the eye from which you get the distinct impression you would not want to cross them – or offend their highly-formed styling sensibilities. One thing that could offend them is Jess’ latest malapropism: confusing calacatta marble, which is underneath her new fireplace in the form of a hearth, as “Calcutta marble … which is the real deal”. The city now known as Kolkata is not exactly well known for its production of marble, Jess. First for the judges, Kerrie and Spence’s: while the size of the dining table is praised, but the heft of that coffered ceiling, being so low, is not. 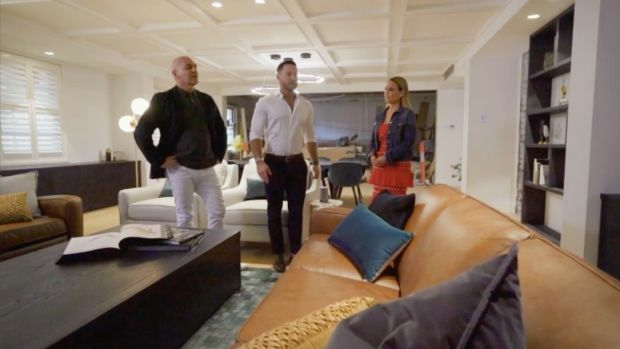 “This is a feature ceiling that needs to sing on its own, and I’m not getting the breathing space to appreciate its beauty,” says Shaynna Blaze. The judges decided against playing cricket in the room – even though there’s plenty of room to do so. “I feel like I’m in a ’90s boardroom,” she continues, referring the styling that all three judges say needs to “loosen up”. Over at Hans and Courtney’s, they win praise for a walnut and emerald dining combination, and a room that has personality. This is a room that also has a bar that emerges on command with home automation, so RIP me if I ever get to visit this place. 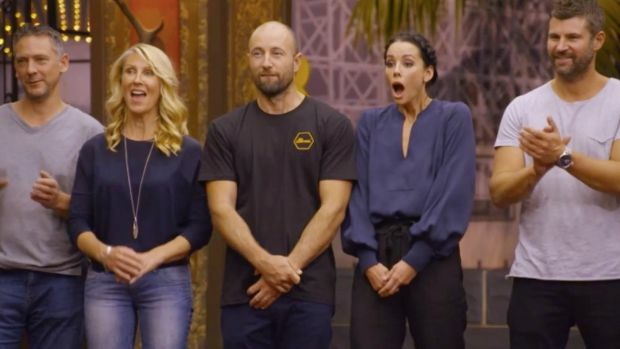 Courtney’s well-established fear every week of negative feedback is not realised, with all three judges thrilled with a room that serves its purpose. Back at Heartbreak Hotel, also known as Hayden and Sara’s, after some initial pleasantries — Darren Palmer loved the lounge and chairs, Blaze the colour palette and the floorboards — the criticism flows. The judges hated that Luna Park wallpaper, too. Sara and Hayden are unapologetic. I’m shocked. Sara and Hayden’s orientation is flawed, says Palmer (perhaps another metaphor, for their performance thus far) and Whitaker agrees that the two can’t work out their aesthetic. Sara is partially vindicated when all three judges agree that the contentious door is pointless. And as they leave, Palmer notices his and Blaze’s books on display. “Well, they obviously didn’t open them,” she replies. Ouch. Upstairs at Jess and Norm’s, Palmer has a new crush. The whole room. “That’s hot,” he says, in raptures. Blaze loves the coffee table and the living room section and Whitaker says the two have excelled themselves. Blaze, though, is biting her tongue. Not for long. She hates what’s been done with the fireplace. In a big way. It’s “the tonsil in the centre of the room – that’s not centre”. It’s a firm no from her. “The placement is possibly the worst placement I have ever seen,” she says, despite loving the fireplace itself. The functionality of the room is also a problem, but Palmer loves it all. Get a room, Daz. Oh wait. 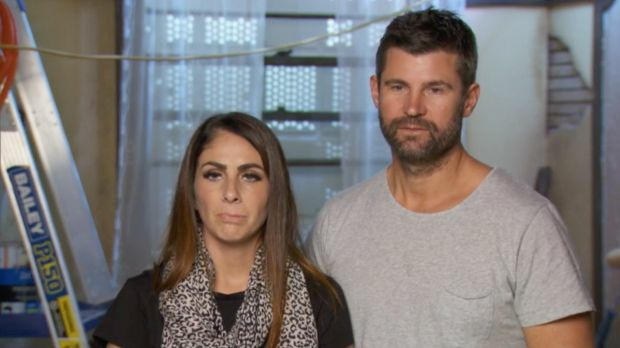 After also attacking the dining table, describing it as mean for the space and “squat”, Blaze reckons Jess and Norm have cut off one-third of their market. At least she justifies her words with a score of 6.5. Over at Bianca and Carla’s, the pendant light wins huge praise, as does the black cabinetry and detailing and the team’s consistency across the room. Surely it’s our time to win? 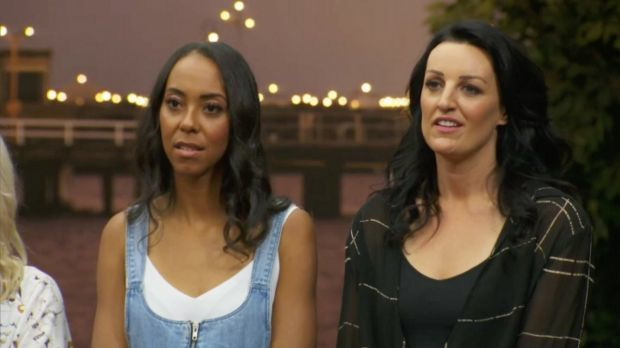 But Whitaker doesn’t find the same impact in their “undercooked” living room, and Blaze describes as ridiculous the placement of their air-conditioning duct, a sore point for Bianca and Carla over the past few weeks. These two have come close to winning five times before, and they desperately want a win. But it wasn’t to be.